We are offering tailor-made and customized budget golden triangle tour packages by private cab or by trains in delhi agra jaipur circuit along with budget delhi tours, budget jaipur tours, budget agra tours, budget agra taj mahal tours and enjoy budget golden triangle tourism packages in North India to visit Delhi Agra and Jaipur. Upon arrival meet and assistance by travel guide of choosed tour operator at international airport in delhi & transfer to the pre booked hotel as mentioned in tour itinerary. Relax from long journey. Overnight stay at the hotel. After a leisurely breakfast take guided sightseeing tour of New Delhi where ornate buildings recall the days when India was the Jewel in the crown of the British empire. Visit the 11th century Qutab Minar, India Gate and the grand government buildings, the President's House, Raj Ghat - Mahatama Gandhi Memorial, Also visit Laxmi Narayan temple popularly known as Birla Temple. Night stay in Delhi. After an early breakfast drive to taj mahal city Agra (204 km / 4 hours). On arrival, check in at the pre occupied hotel & take some snakes and refresh yourself to visit the grand Agra fort ( red stone construction ). The Agra Fort is an imposing structure that stands in all its glory on the banks of the Yamuna River and is a classic example of Mughal architecture. The fort also houses the Pearl mosque that was designed and built in 1565 AD by Emperor Akbar. Enjoy a lunch break before visiting the ethereal Taj Mahal, Agra's main claim to fame. TAJ MAHAL - Little needs to be said about this architectural wonder which is always the soul raison-de-etre for every tourist's visit to Agra. 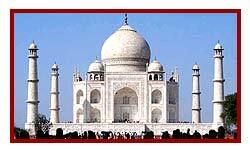 Built by Shah Jahan the Taj is a white marble memorial to his beautiful wife Mumtaz Mahal. This monument took 22 years to be completed and was designed, and planned by Persian architect Ustad Isa. Apart from its stunning design balance and perfect symmetry, the Taj is also noted particularly for its elegant domes, intricately carved screens and some of the best inlay work ever seen. also counted as one of the Seven Wonders of the World. 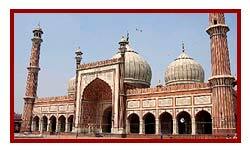 Proceed for visit to the Taj Mahal, Agra Fort and Itmadullah's Tomb with English speaking guide. Evening free to explore the Agra's rich heritage of handicrafts in its markets. Overnight stay in Agra. After breakfast drive to Jaipur- the fabled pink city" of the desert named after Jai Singh, the former Maharaja of Jaipur. This is the only city in the world symbolizing the nine divisions of the universe through the nine rectangular sectors subdividing it. The palaces and forts of the yesteryears, which were witnesses to the royal processions and splendours are now living monuments enroute visiting Fatehpur Sikri-a perfectly preserved red san ds tone ghost town" which was the estranged capital of mughal emperor Akbar, built in 1569 and deserted when its water supply failed. Arrive Jaipur in late evening & transfer to hotel. Night stay in Jaipur. After a leisurely breakfast, visit the majestic Amber Fort, is one that can't be easily described. 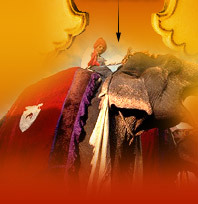 Enjoy Elephant ride to the former capital of the royals set against the backdrop of the wooded hills. Later visit the City Palace, Palace of Winds also known as Hawa Mahal, this elaborate building, now little more than a façade, is encrusted with delicate screen sand carved balconies from which the royal ladies, confined to their quarters, could sneak views of the outside world. Past, present and future merge at Jai Singh's observatory, where time has been accurately measured since the 17th century. Overnight stay in Jaipur. After breakfast drive to Delhi, en-route visit Sikandra famous for Great Akbar's Tomb after that proceed drive to delhi. Upon arrival Delhi in approx 05 Hours & directly transfer to airport for onward flight with sweet memories of delhi agra jaipur golden triangle tourist attractions.